Interviews for a new Teacher of English have filled much of today. The field was extensive and strong and we had the privilege of spending time with some superb candidates. The Head of English and I interviewed together while other colleagues observed lessons, offered guided tours and provided opportunities for informal dialogue. One answer to a question posed sticks in my mind. My colleague asked, “how effective is feedback and marking and, in your experience, how effective is peer assessment?” The reply: “marking is the backbone of teaching, onerous and heart-breaking though it is”. I do a lot less marking these days than I once did (other equally unglamorous tasks have amply filled the void, whatever anyone might think of Headship), but I did glance at my growing pile of Year 11 end of term reports as I absorbed these words. “Teachers and parents will have to be brave – it’s time to consign most marking to the dustbin” wrote Bernard Trafford, the man who first appointed me to a school teaching job. There’s a statement in Bernard’s article that reads, “All of us, including parents who take solace in that mark on the page, should abandon the mindset that only a fully and regularly marked book can demonstrate progress. Moreover, we need to be cleverer about the homework we set, and be clear about what it’s designed to achieve” i.e. not just high marking loads for teachers. I’m not sure how brave I’m feeling on this issue, but I do recognise that excessive marking steals time away from capable and creative teachers who would otherwise invest themselves in developing interesting and effective lessons, or enjoying an evening away from the chalk face to maintain a sensible life balance. Providing students with marks and feedback is necessary and potentially valuable in the learning process, but I can’t help thinking of the old axiom that you don’t fatten a pig by weighing it. A blunt image but not without worth. In order to meet the Teachers’ Standards, teachers need to provide students with regular feedback that can be shown to aid their progress. Feedback to illustrate, broadly, where learners are at and how to improve is clearly a good thing and accepted a priori by most. Critical and questioning minds might, however, need persuading of this point. 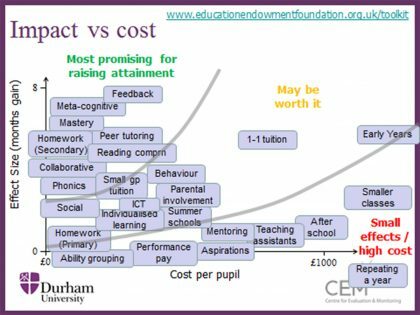 Durham University data, harvested from multiple studies, illustrated below, provides a useful quick reference of what works best in terms of raising attainment. Providing feedback scores highly. Nevertheless, subtleties exist and research into the effectiveness of feedback repeatedly shows that long and detailed comments on students’ work may not have the impact teachers might be seeking. Time spent doing it could, many educationalists argue, be used more effectively in ways that have a greater positive impact on students. The argument therefore, as I see it, is not about whether or not marking and feeding back is a good thing, rather how much time and effort should teachers devote to it? Moreover, how might these parts of the expert/learner interaction proceed most effectively? Like many teachers, I am not blind to the many studies that encourage a diversification of marking styles, a targeted and appropriate application of ‘deep’ marking when required and a healthy scepticism of the latest fad, like double marking and so on. I have implemented the recommendations of training sessions attended, introduced marking journeys for my classes. I have purchased, used and freely dished out to peer marking pairs multi-coloured biros (inexpensive ones that usual run dry in five minutes) and post-it notes, deliberately not told classes which piece of classwork or homework was going to be assessed in a block of teaching (keep them guessing!) and.. and… and. If I’m being honest, it was oddly comforting for me to stack-up neatly packed exercise books annotated with rainbow coloured feedback on my classroom shelves; and comforting too for the students, I think, who felt they were making progress. I still cling to that judgement, perhaps wrongly, as braver souls nudge for a paradigm shift. And yes, I know ‘I need to get out more’. I am looking at those Year 11 reports again now. In all the debate about the purpose and value of marking and writing reports, I wonder if an essential human ingredient has been missed. When a teacher reads, assesses and comments on an individual’s work, when bespoke attention is gifted in this way, it signals that the expert cares about what the novice is doing. It indicates that the pupil is valued. For me, spending time marking has always been more than just a technical exercise in grading and pointing the way forward for a particular form of academic improvement. It’s a way to foster a connection. Relationships are at the heart of education – build appropriate ones and learning will flourish. Providing feedback is a one-to-one interaction, a conversation starter between two people and an opportunity for a Geographer like me to do more than just correct a list of countries and capital cities. As Dylan Williams has argued persuasively, marking and feedback ought to be provided primarily for the purpose of improving the learner and not any given article of work. Reports are the same. As a Head, I read them all, carefully. I makes notes, sign them and comment on a few. I wish I had the time to do more but the job has changed from what it once was and demands on time have shifted. However, every student is visible to the Head when reports are read and the hard work of all is recognised and appreciated in that moment. Marking and reporting matter and provide amongst other things opportunities for dialogue between the learner, their supportive families and teachers. It helps to build connection and mutual understanding. I’m pleased to say that everyone we interviewed today ‘gets this’, which is hugely encouraging as we move to make an appointment. 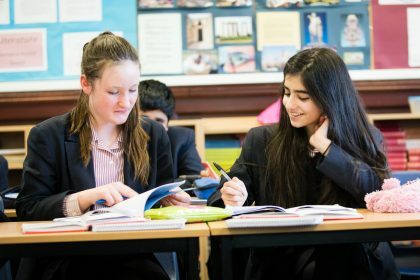 “For me, spending time marking has always been more than just a technical exercise in grading and pointing the way forward for a particular form of academic improvement. It’s a way to foster a connection.